An RC Baron in GTA Vice City. The RC Baron is a miniature remote controlled airplane that appears in Grand Theft Auto: Vice City and Grand Theft Auto: San Andreas. The RC Baron is designed as a model bi-plane with a red body; this design trait, coupled with its name, suggests the plane's design is inspired by the Red Baron, an ace pilot in First World War. In its first appearance in GTA Vice City, the RC Baron originally featured landing gear wheels derived from sports cars in the game; for GTA San Andreas, the landing gear was modified to appear more to scale of the plane. The GTA San Andreas rendition also comes with a functional machine gun. The RC Baron has been adopted for use in several missions in both GTA Vice City and GTA San Andreas. For GTA Vice City, the Baron attains the ability to drop bombs during "Bombs Away! ", and is integral to the RC Baron Race side quest from the top the North Point Mall's multistory parking lot; in both cases, the player must enter a Top Fun van in order to fly the planes. 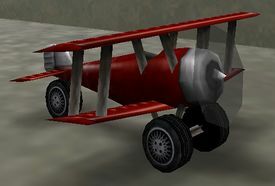 In GTA San Andreas, the Baron is used in two missions for Zero: "Air Raid", where it is used against Zero, and "Supply Lines...", where CJ uses it in order to help Zero to destroy Berkley's delivery service. The Baron is also used in an optional "Beefy Baron" side-mission for the same purpose as "Supply Lines...". The Baron has a self destruct capability along with a fuel meter in the latter two missions. The RC Baron is otherwise unattainable outside the missions unless trainers or modifications are used. The GTA San Andreas rendition of the RC Baron comes with blinking lights on the wing, similar to a full-sized plane in the game. In GTA Vice City, the RC Baron's wheels are much larger than the San Andreas rendition. This page was last modified on 23 July 2012, at 23:32.